With Charter One, you can find incredible waterfront wedding venues. Sail away with your mate on a fabulous wedding on the water celebration. There are many places where you can choose to have your wedding, but none of them will be as refreshing and exciting as sailing on the beautiful blue coastal waters of South Florida. You and your guests can indulge in comfort and style, while taking in stunning panoramic vistas and sunny skies on our waterfront wedding venues. Discover the magic of sunlight dancing on the waters of the South Florida Intracoastal, while puffs of white clouds go scudding by. The movement of cruising along the water, and the majestic outdoor environment will invigorate you and your guests as you celebrate your wedding day. Be enchanted with this dramatic backdrop, as you begin your new life together with your loved one on a spectacular wedding on the water. You and your guests can enjoy sophisticated ambiance aboard our stunning luxury yachts. We provide the finest Five-Star dining experiences, plus excellent personal service. Our yachts are designed with a contemporary flair, and comfortable indoor and outdoor lounge areas. We provide every modern amenity aboard our beautiful yachts, and offer convenient dock locations for you and your guests to embark ship. You can select one of our wedding venues by the beach after you have crafted your guest list. If you are expecting up to 550 guests for your wedding on the water, we recommend our magnificent 128-foot vessel The Grand Floridian. This grand lady boasts 4 decks, custom full-service bar, elevator service, multiple dance areas, media capability, 13 HD TV’s, private staterooms below deck and much more. 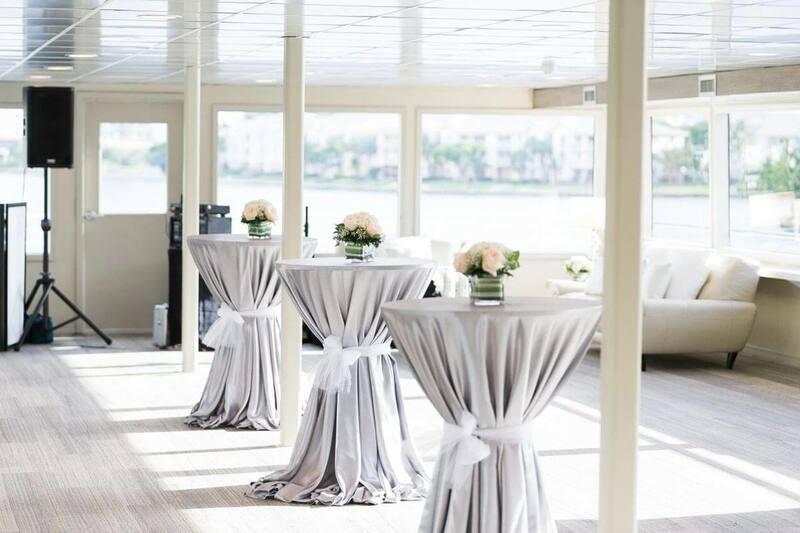 For a more intimate wedding with up to 60 guests, we suggest our regal Summer Wind yacht. This stately lady boasts 3 decks, a custom full-service bar, a swim platform, state of the art media capability, private staterooms and much more. The Summer Wind is the perfect choice for having your very own private yacht venue for your extraordinary wedding day. Your dream wedding will be the talk of the season, and our wedding planners will help to make it a reality. Our team will work with you every step of the way, and will execute your vision down to the smallest detail. You will discover that dreams really do come true with a Charter One yacht wedding. We have all the necessary resources that you will need for your fabulous big day, plus, we will decorate with any theme you choose, to create an inviting and sophisticated ambiance. All you have to do is make your selections and we do all the work; it’s that simple. Our culinary team delivers a superb dining experience that will have your guests coming back for more. Our team will assist you in selecting a skillfully impressive meal plan from a variety of menu options. We use only the freshest ingredients in our food, and our celebrated chefs are experts in showcasing creative culinary presentations. Our waterfront wedding venues are a tour de force, produced by a great team of experts. To begin making plans for your dream wedding of a lifetime, contact Charter One today at: 954-771-0102.